How to use Gas Operated Airsoft Guns? Everyone wants GAS gun, but only a several people could imagine how to manipulate with. That's why I decided to write the following guidelines and recommendations are based on personal experience, the experience published on the Internet and recommendations from weapons manufacturers. Most were verified by practice and testing. When filling the magazine with GAS, it must be always go upside down. Likewise, the bottle with GAS must always be turned upside down. The filling nozzle must be absolutely perpendicular to the cylinder valve. If you do not do it so, will result in insufficient fulfillment the magazine or eventually you can destroying the valve in the magazine. The time of filling the magazine depends on its capacity. 25-bb magazines are enough to fill for about per 3 seconds. Magazines with a capacity of 50 bb are filled for about per 5-6 s. When the magazine is overcrowded, we will see that the GAS aerosol will spray out of the valve. During the shooting may also keep to leakage of GAS from the magazine. After filling the magazine, do not shoot immediately. Let the magazines warm for about 3 minutes, in depending on the ambient temperature. On the magazine side is usually a button to release the GAS content. Do not use it! You may prematurely wear the valves and seals in the magazine (due to frost, etc.). A better way is to simply fire off the weapon. On the Internet, I also found recommendations on storing the magazines. It is not recommended to leave the magazine full or empty. The best thing is to keep the GAS about 1-2 shots in it. Keeping this rule should increase the life of the sealing elements in the magazine. 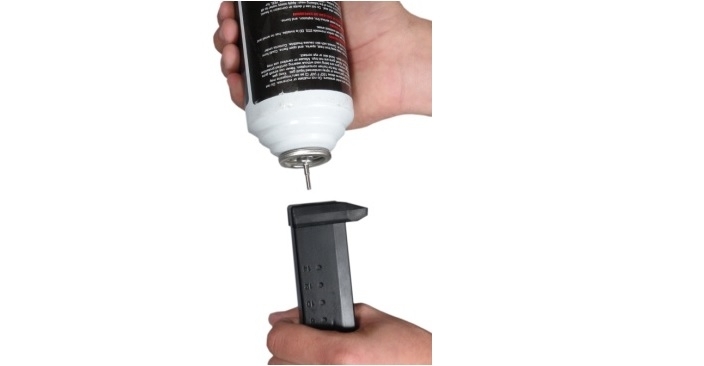 GAS guns are designed for warm weather (above 10 ° C). It is not good to use them in the winter because the expanding GAS itself cools the weapon. There are a regular frozen sealing rubbers, valves and nozzles, at low temperatures and this leading to premature aging of important parts. At low temperatures is also greatly higher GAS consumption. Some GAS guns can not be used in winter at all, because they can not be filled with GAS, or the GAS escapes after the first shot. In the GAS gun use really good quality ammunition because it may damage the sophisticated GAS mechanism otherwise. It is generally recommended to use seamless and polished Marui or Excel ammunition. We must often lubricate all moving parts and sliding surfaces of the weapon. This is especially true for BlowBack system guns. Suitable is a lubricant based on silicone oils which do not destroy plastic and rubber parts in the weapon. Also, it is good to lubricate the upper part of the ball feeder in the magazine and the rubber seals on the magazine and the gun. Keep in mind that proper maintenance of the weapon greatly prolongs its service life! Red GAS – designed for a highly upgraded GAS gun with a metal breech or for sniper rifles with reinforced inner parts.